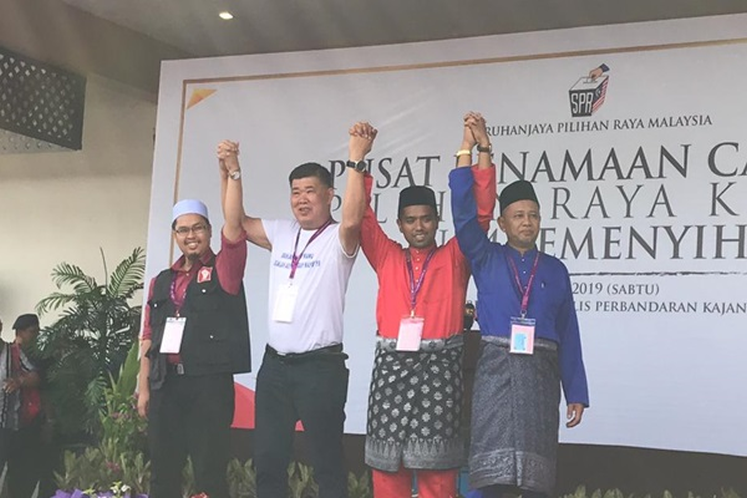 SEMENYIH (Feb 16): It’s a four-cornered contest in the Semenyih State by-election on March 2, between Pakatan Harapan (PH), Barisan Nasional (BN), Parti Sosialis Malaysia (PSM) and an Independent candidate. PH, which is defending the seat, has fielded engineer Muhammad Aiman Zainali, 30, who is the treasurer of the Parti Pribumi Bersatu Malaysia (Bersatu) Hulu Langat Division (and also son-in-law of the late PH Assemblyman Bakhtiar Mohd Nor whose death on Jan 11 resulted in the by-election). BN has nominated Zakaria Hanafi, 58, the permanent chairman of the Kampung Sesepan Kelubi UMNO Branch and PSM, its youth wing central committee member Nik Aziz Afiq Abdul, 25. The Independent candidate is social activist Kuan Chee Heng, better known as 'Uncle Kentang'. Semenyih State by-election returning officer Datuk Mohd Sayuthi Bakar announced the names of the candidates at 10.25am after the close of the one-hour nomination at 10am in the Seri Cempaka hall of the Kajang Municipal Council in Saujana Impina, Kajang, 12 kilometres from Semenyih town. Mohd Sayuthi said no nomination paper was rejected. He said Muhammad Aiman submitted his nomination papers at 9.03am; Zakaria, at 9.05am and Nik Aziz Afiq and Kuan at 9.10am. Leaders and supporters of the candidates from the three parties had gathered as early as 7am in the vicinity of the nomination centre. Muhammad Aiman arrived at the nomination centre at 8.45am, accompanied by several top PH leaders among whom were PH deputy president and the Bersatu president Tan Sri Muhyiddin Yassin; PKR deputy president Datuk Seri Mohamed Azmin Ali; Amanah president Mohamad Sabu; DAP secretary-general Lim Guan Eng and Selangor PH chairman and Menteri Besar Amirudin Shari. Zakaria had moral support from BN and PAS leaders, among whom were UMNO deputy president Datuk Seri Mohamad Hasan; Selangor UMNO Liaison Committee chairman Datuk Seri Ismail Sabri Yaakob and PAS secretary-general Datuk Takiyuddin Hassan. Nik Aziz Afiq of PSM arrived at the nomination centre at 8.57am and Kuan, at 9.06am. PH and BN leaders were seen exchanging greetings and engaging in conversation while waiting for the nomination process to be completed. The Semenyih constituency has 54,503 registered voters, comprising 53,520 ordinary voters, 951 early voters and 32 absentee voters. The Semenyih by-election is the sixth after the 14th general election (GE14) in May last year; the others were the Sungai Kandis State by-election (on Aug 4 last year); Balakong and Seri Setia State by-elections (Sept 8); Port Dickson Parliamentary by-election (Oct 13) and Cameron Highlands Parliamentary by-election (Jan 26 this year). The Semenyih seat fell vacant on Jan 11 following the death of the PH Assemblyman, Bakhtiar Mohd Nor, 57, of a heart attack. In GE14, Bakhtiar polled 23,428 votes to beat three other candidates –- Datuk Johan Abd Aziz (BN), Mad Shahmidur Mat Kosim (PAS) and S Arutchelvan (PSM) –- to win with a majority of 8,964 votes.